Intracellular Redox State as Target for Anti-Influenza Therapy: Are Antioxidants Always Effective? Influenza virus infections represent a big issue for public health since effective treatments are still lacking. In particular, the emergence of strains resistant to drugs limits the effectiveness of anti-influenza agents. 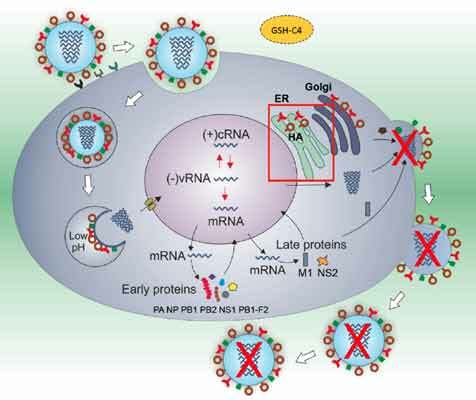 For this reason, many efforts have been dedicated to the identification of new therapeutic strategies aimed at targeting the virus-host cell interactions. Oxidative stress is a characteristic of some viral infections including influenza. Because antioxidants defend cells from damage caused by reactive oxygen species induced by different stimuli including pathogens, they represent interesting molecules to fight infectious diseases. However, most of the available studies have found that these would-be panaceas could actually exacerbate the diseases they claim to prevent, and have thus revealed "the dark side" of these molecules. This review article discusses the latest opportunities and drawbacks of the antioxidants used in anti-influenza therapy and new perspectives. Anti-influenza therapy, Antioxidants, Antivirals, Influenza virus, Oxidative stress, Redox state.